This crock pot corned beef and cabbage recipe is convenient and easy, and it's a complete meal. 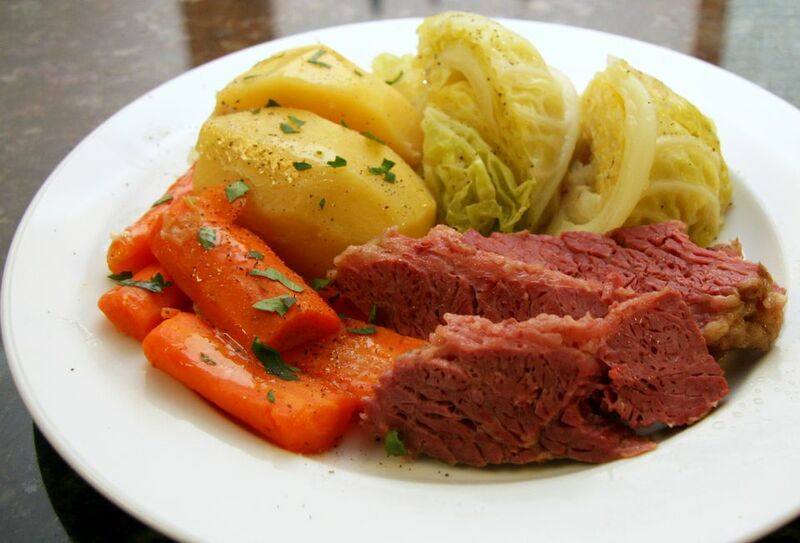 The corned beef brisket is cooked to perfection in the slow cooker, along with potatoes, carrots, and cabbage wedges, for a fabulous Sunday dinner or St. Patrick's Day feast. Feel free to add some sliced parsnips to the vegetables, or add a small peeled and diced rutabaga or a few cut-up turnips. Sliced onions or a handful of small boiling onions along with the celery are excellent additions as well. Cooked corned beef makes for fabulous leftovers. Use cooked corned beef in homemade potato and beef hash, in casseroles, soups, and in egg dishes. Feel free to use a large brisket if you plan to use the leftovers in other recipes. Peel the potatoes and cut them into 1/2-inch slices. Peel the carrots and slice them into 1/4-inch rounds. Lightly butter a 5- to 6-quart crock pot, or spray it with nonstick cooking spray. Layer the potato slices over the bottom of the pot with carrots and celery. Place corned beef on vegetables. If it doesn't fit comfortably in your slow cooker, cut it into 2 or 3 pieces. Slice the cabbage into 8 wedges. Arrange the wedges around the meat and add the pepper and water. Alternatively, if the slow cooker is not large enough, boil the cabbage wedges on the stovetop in a small amount of lightly salted water about 10 to 15 minutes before the corned beef is ready. Reduce the heat to low and continue to cook on the low setting for 6 to 8 hours, or until the corned beef and vegetables are tender. Remove the meat to a platter, cover with foil, and let it rest for 10 to 15 minutes before slicing. Don't leave cooked corned beef at room temperature for more than 2 hours. Pack it into shallow containers, and refrigerate or freeze. Use refrigerated cooked or leftover corned beef within 3 to 4 days. Freeze diced or sliced leftover corned beef for up to 3 months. Reheat all leftovers to the minimum safe temperature of 165 F.
Flat cut or point cut, what's the difference? A flat cut corned beef brisket is lean and shaped like a flat rectangle. It's the best choice if you plan to slice the corned beef. The flat cut is also leaner than the point cut. The point cut is a fattier and more tender cut. If you want a very tender, falling-apart brisket, choose the point cut. A low starch potato is the best choice for the slow cooker. High starch potatoes—e.g., russets, Katahdins, Idaho—tend to break down over a long period of cooking, while low starch—or waxy—varieties hold their shape. Low starch potatoes include red-skinned, fingerlings, Rose Gold, and new potatoes. Or use Yukon Gold potatoes; they are slightly waxy, all-purpose potatoes.